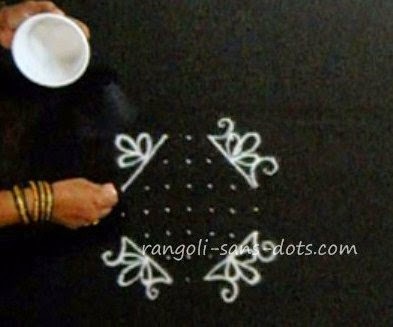 This collection of rangoli designs / muggulu designs with 7 dots are suitable if you are looking for simple patterns or designs for learning, for festivals and occasions. 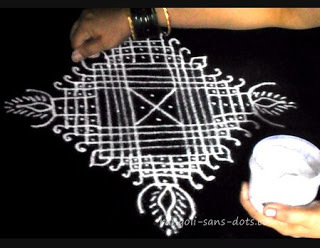 The pulli (vecha ) kolam details are shown through intermediate steps for learning and reference. The latest and newest kolam are invariably added at the top and the content has been written accordingly. 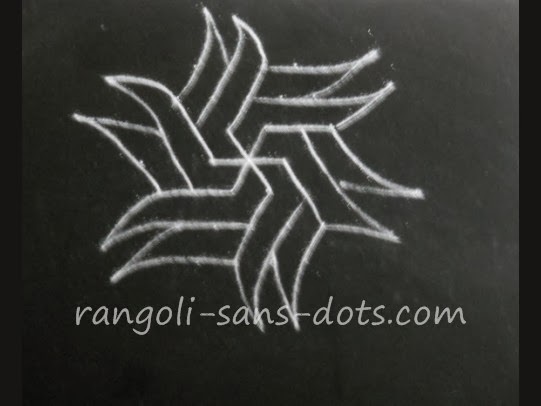 Why does one need to know or practice many rangolis. Why do we need to combine the many motifs, designs in various combinations to arrive at new designs. 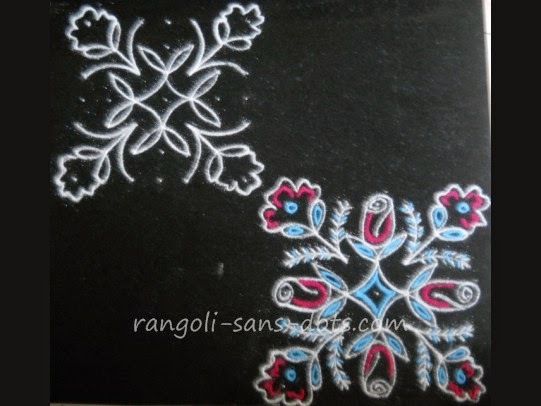 Why would one need free hand designs and rangoli with dots. 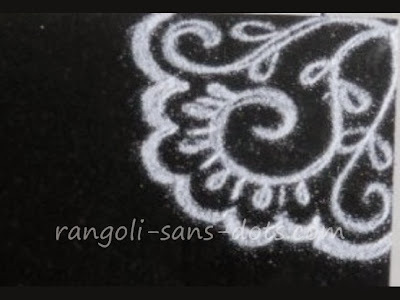 All these questions are answered when we know the philosophy behind the art of rangolis. 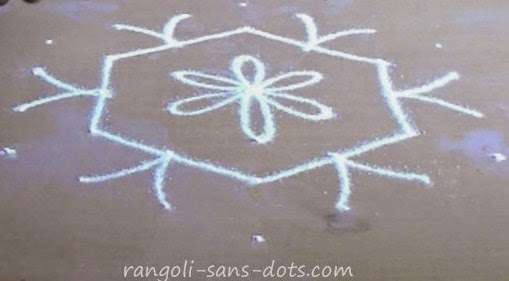 Rangolis are drawn at the entrance of homes. The reasons attributed are many. One of them is that they are drawn to welcome guests. 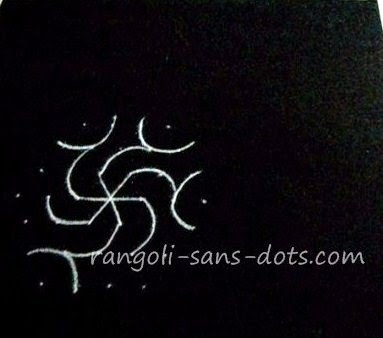 Since they are drawn with rice flour or rangoli (powder ) or a mixture of both, at the end of the day the design drawn gets erased. 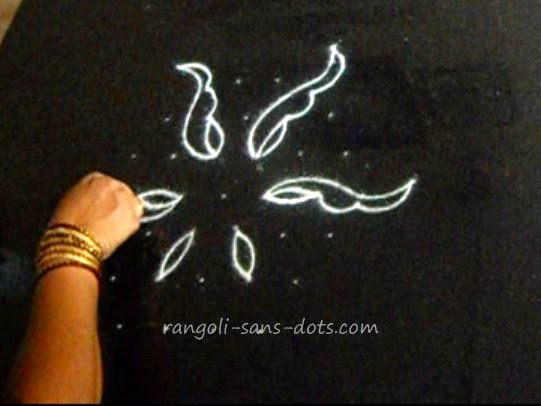 Ephemeral is an adjective associated with rangoli quite often. It lasts for a very short time, only for one day. 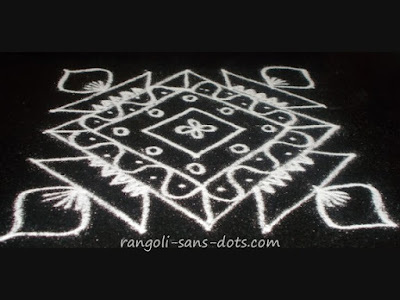 It cannot be preserved when drawn with rangoli or rice powder. 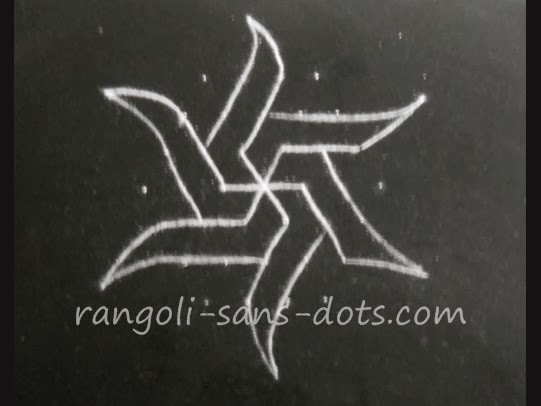 Hence the necessity to draw new, newer rangolis. Obviously, repeating the same designs means the person who draws and those who view will lose interest. 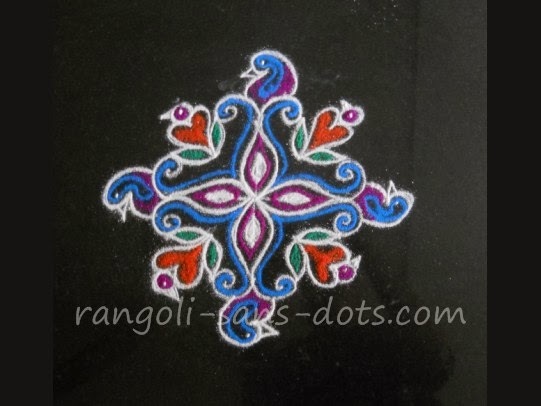 In such an art like rangoli novelty is welcome. So the need to think of, practise and draw new and different types every day. It is practically not possible to draw rangolis in the literal sense (i.e with colours ) every day. 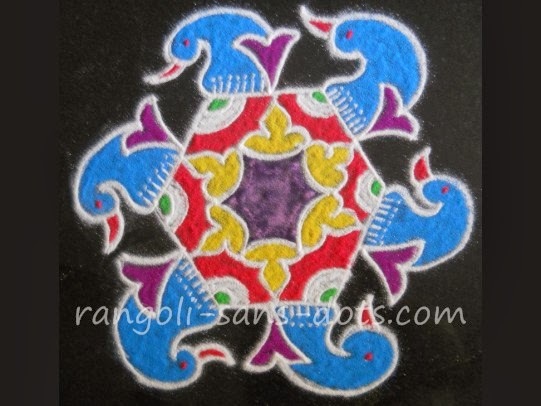 We usually draw plain designs daily and with colours for occasions and festivals. It is possible to draw a beautiful Pongal kolam with pots or pot and sugar cane using just a 7 dot grid. The two rangoli designs with 7 by 7 dot grid show how we can get beautiful and simple rangoli for Sankranti or Pongal. 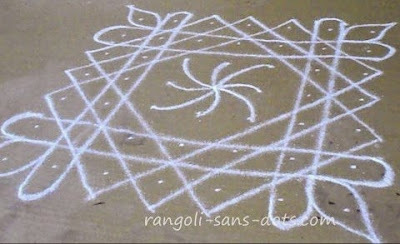 With the same 7 by 7 dot grid we can get a Pongal kolam or Sankranti muggulu with dots with a Pongal Paanai and two sugar cane and the sun. 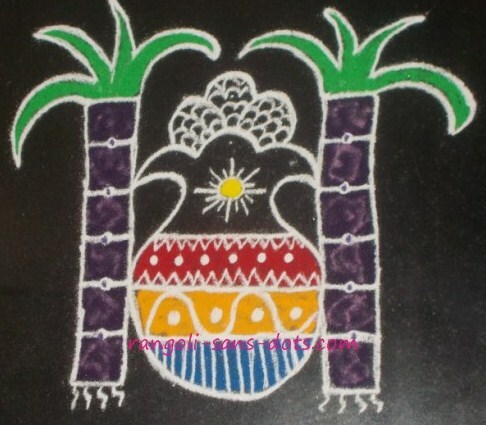 All these three symbols represent the harvest festival Pongal. 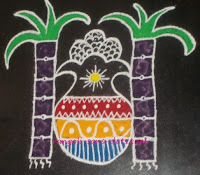 Also celebrated as Makara Sankranti in Andhra Pradesh, Karnataka and Maharastra and other parts of India. 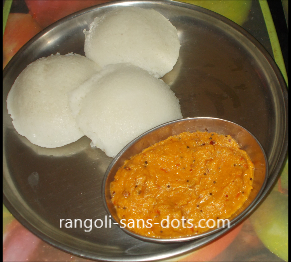 My mother called it the Pedha Pandaga or big festival in Telugu. 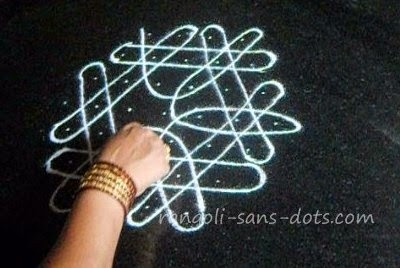 After a long time one more simple seven dot kolam is added to this gallery of kolam with steps. This is common and simple kolam with 7 to 4 dots. The photos shown below are self explanatory. 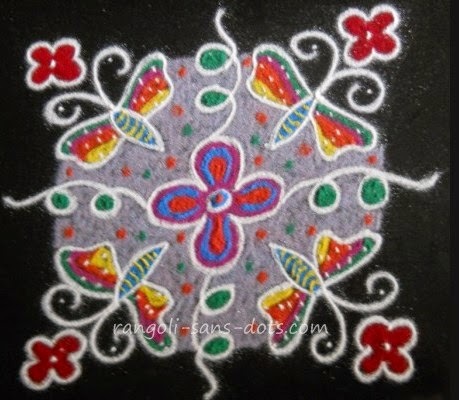 To the common kolam I have added some decorations inside to get a new type of kolam. The arms can be drawn to give a clockwise or anti-clockwise appearance, however clockwise is preferable. 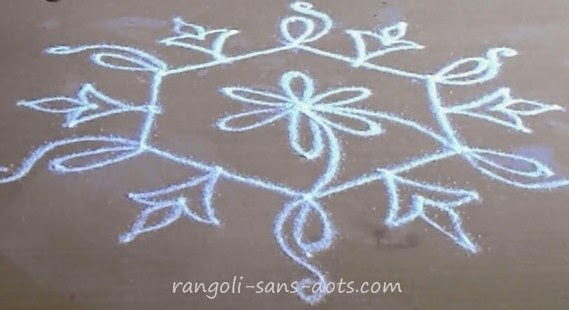 If we want a common and simpler design for Pongal festival kolam or Sankranti festival rangoli designs the next rangoli may fit the bill. 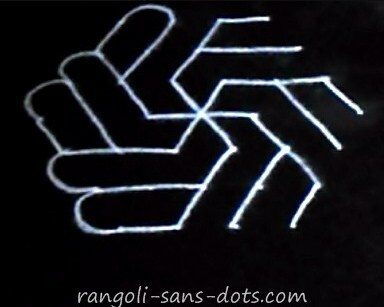 It is a commonly used design with 7 by 7 dots again. I have added some patterns for decoration. The rangoli design drawn at the entrance of my house during Margazhi kolam season. 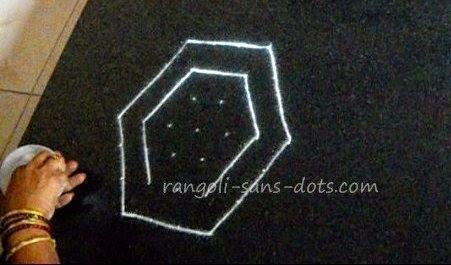 Asimple kolam with 7 by 4 dots grid (idukku pulli ) using a hexagon as a base ( I have drawn some kolam using 7 dots grid and hexagon already in Rangolisansdots ). The first image shows the hexagon and the basic floral pattern at the centre. 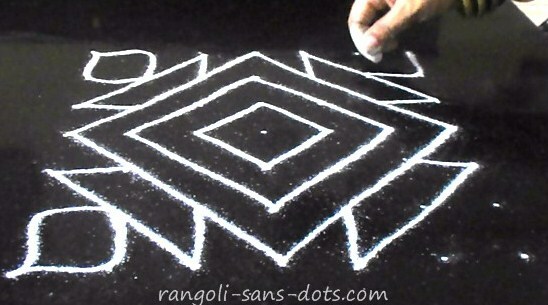 The next image shows the kolam nearing completion with patterns drawn at the edges of the sides of the hexagon and simple motifs at the centre of each side. Finally curved lines that radiate from the centre to each edge add to the beauty of the kolam . 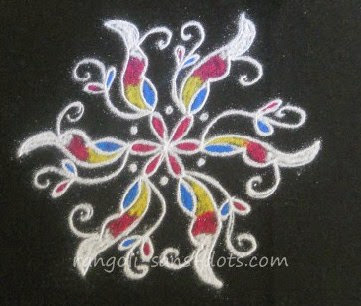 After some kolam designs with colours filled , this one I have left plain, I have tried this kolam on a lighter background. The dot pattern is 7 by 7 dots. The trick is to draw a number of parallel and straight lines as shown in the three images. The dots remaining at the centre are used up with curved patterns and those at the corners with patterns as shown in the second pic. As we do in sikku kolam, the lines are drawn outside the dots. 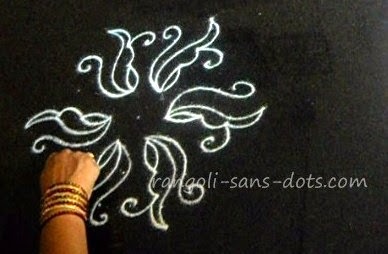 Though the design is simple, it looks elegant when completed even without colours. 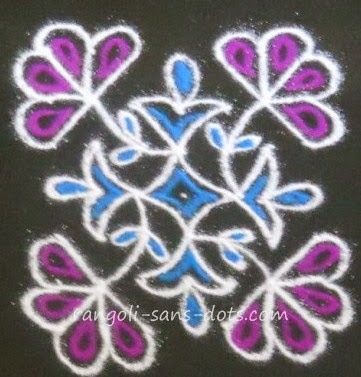 This design, I "invented" while trying a new kolam with 7 by 7 dot grid. 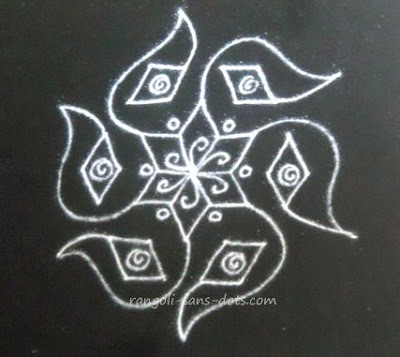 This is a simple kolam that can be drawn for Karthigai Deepam or as a Deepavali kolam design with deepam. 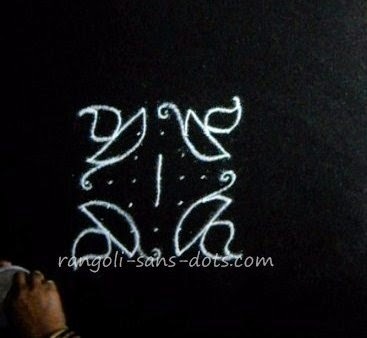 The dot grid is 7 to 4 idukku pulli. 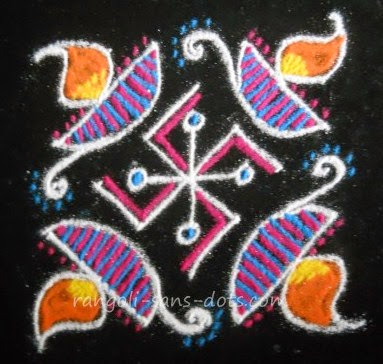 It is suitable when we want to celebrate the festival with a simple design. A simple kolam that can be drawn for these festivals for deepam as a theme. 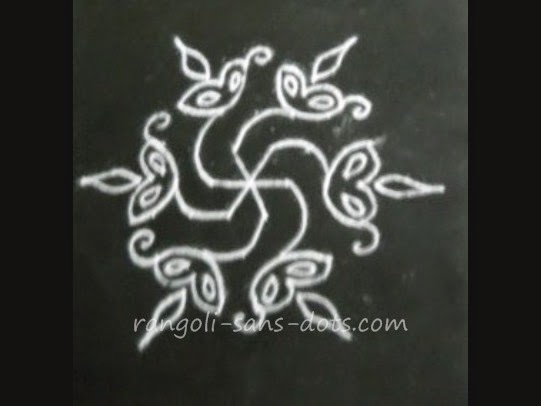 Many a time I have emphasised the important role played by nature in selection of designs for our kolam. 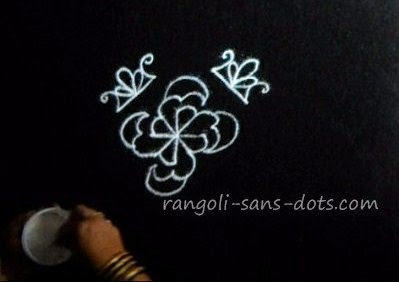 7 dots flower (rose and hibiscus ) rangoli or 7 pulli poo kolam. 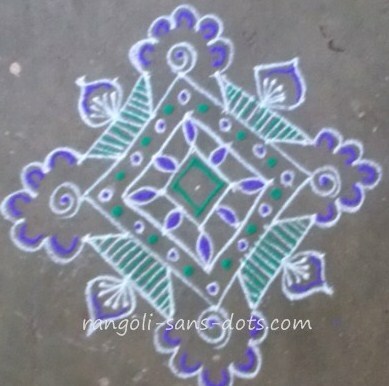 - This kolam may also be drawn as a Margazhi kolam design with dots as Margazhi season upto Pongal through New Year is important for display of colourful kolam in Tamil Nadu , colourful Pongal muggulu with dots. 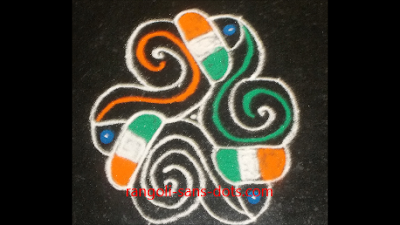 The same design above shown through two images to give a better idea of the steps involved in drawing this rangoli . The first photo shows the first two steps. The pattern at the centre is drawn first. The third and fourth show the flowers ( rose buds and Hibiscus ? ) 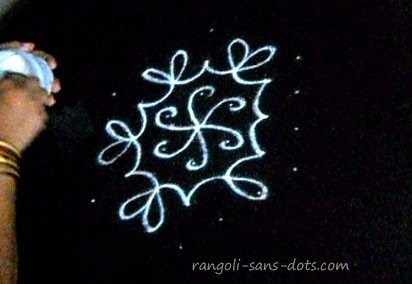 drawn to get a 7 dot poo kolam as we may call it in Tamil. I have given two colourful versions of the final image. The one at the top more colourful and near natural ( so far as the colours are concerned ). The one at the bottom is an easier version for adding colours. 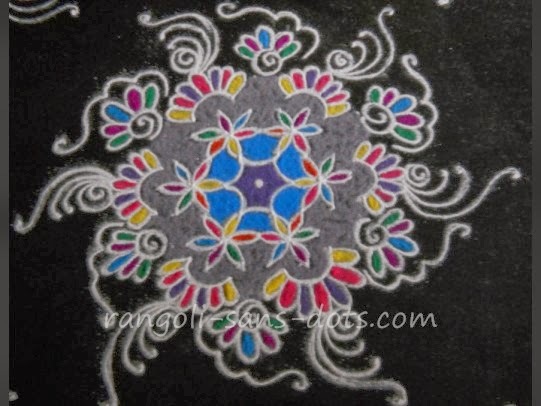 As I have emphasised earlier, muggu, rangavalli or kolam or rangoli or alpona are different names for the same beautiful art. 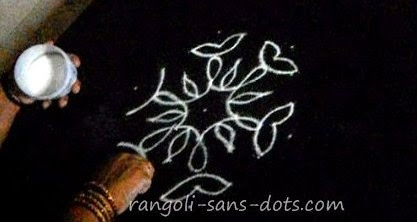 Drawn with dots or without, with colours or without, simple, intricate, complicated, for festivals, for decoration, for competition, for functions, for teaching, for learning, as an activity, as a project or as a hobby. 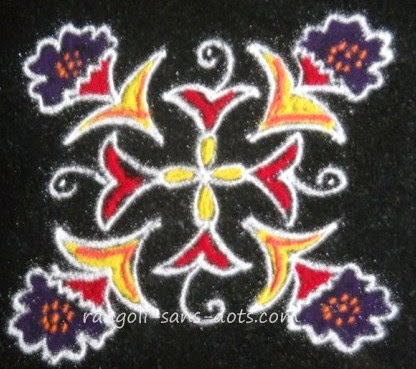 Two versions of the same kolam are shown below only the colours additon is different. The one on the left has a single while the one on the right has a different colouring scheme. 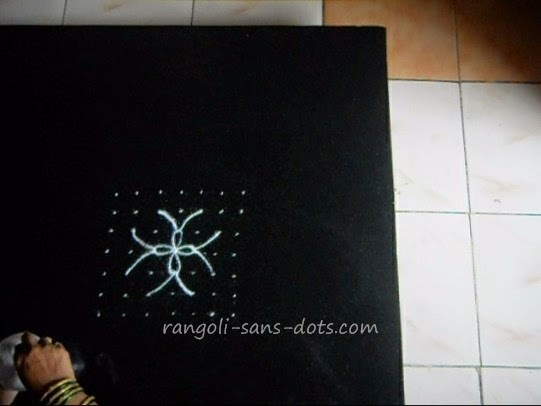 This rangoli has a dot template of 7 by 7. 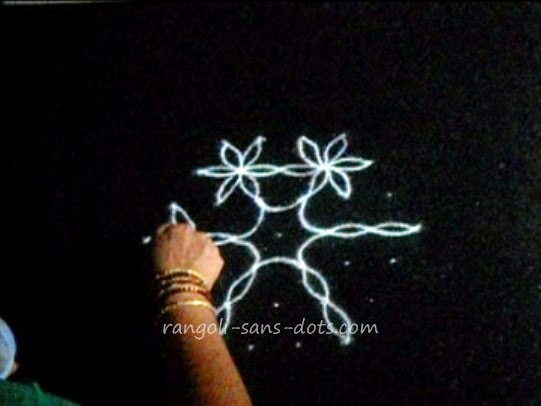 Draw the outer floral designs as shown in the video. 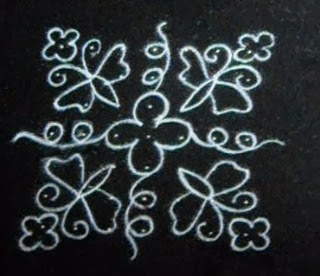 Draw the flower at the centre and add the patterns above as shown in the image. 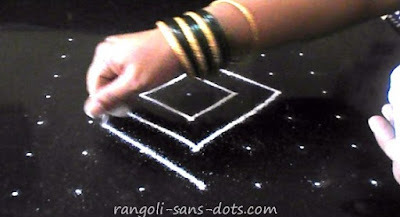 Quite an easy and basic rangoli and can be drawn in very little time. 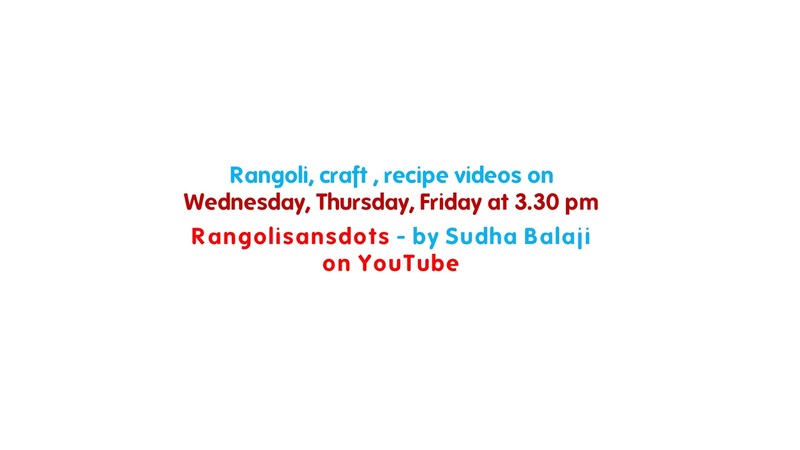 It is quite popular on my YouTube Channel. 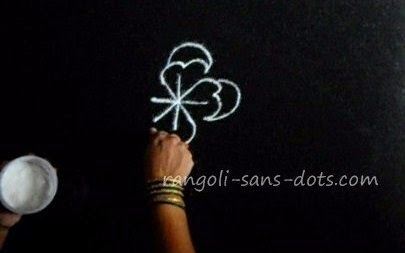 Since it is a very simple design it can be drawn free hand also. 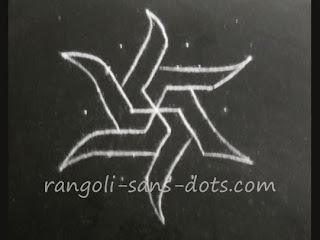 This rangoli has been posted on Rangoli of November 2012 as a free hand design. It can be drawn free hand too. 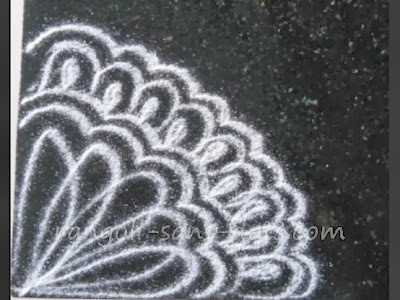 The photo above shows some of the steps in drawing this kolam and are self-explanatory. and the two images below show how it can be drawn without using a dot grid ! 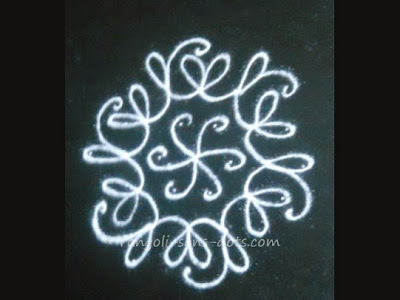 Easy for small kolam designs using basic kolam patterns. 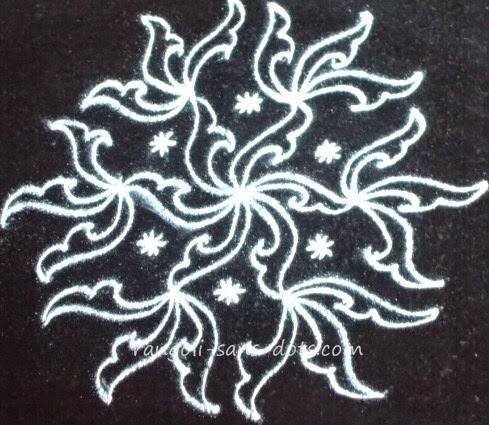 The next kolam design below is also with 7 by 7 dot pattern. 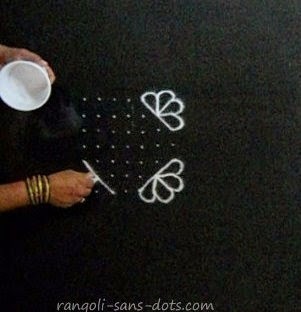 Place the dot grid , draw the four butterflies on the four corners. Draw the four petal floral design at the centre and use up the remaining dots with tendril like patterns. 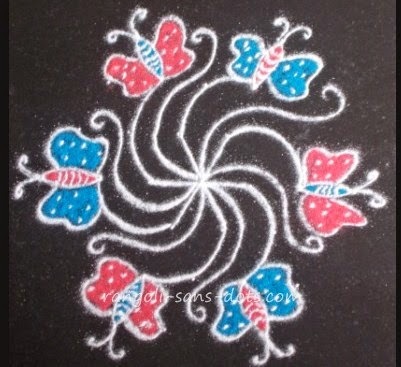 This is a simpler version of a butterfly kolam. The dot grid is 7 to 1 ner pulli. The result is three butterflies with common wings. So we can have three butterflies when the kolam is viewed in three different angles. The images show the steps. 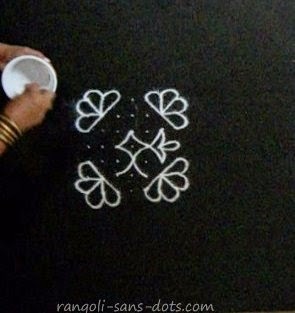 Actually this one element of a common 14 dots kolam that has been converted into a simple but beautiful butterfly kolam. 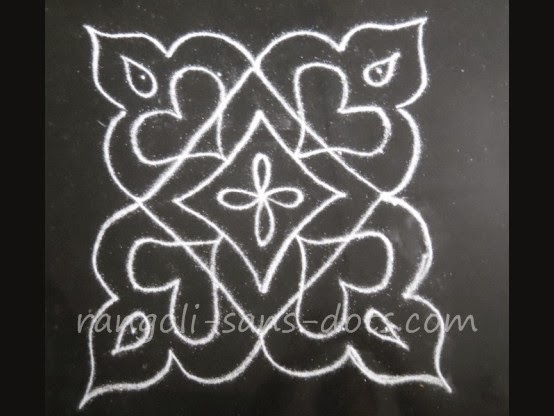 The image above is a dot kolam version of a free hand kolam I drew for Ganesh Chathurti. This is drawn with 7 dots to 1 pattern. Draw the central orange and pink petals. 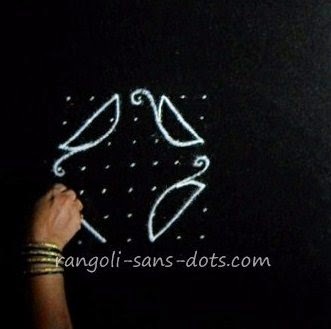 Using the remaining dots create elephants on four sides. Some free hand drawing for lotus and tusks, heads are required. 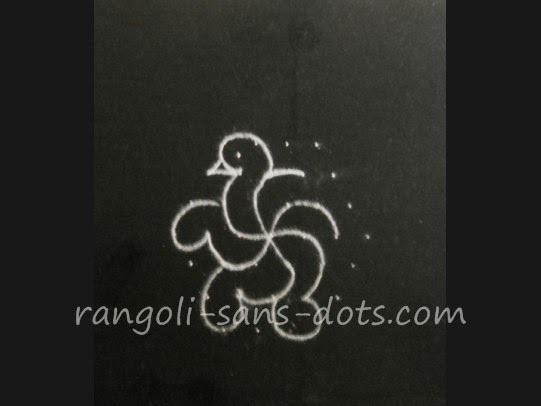 This image below shows how to start the 6 birds with 7 dots rangoli design. 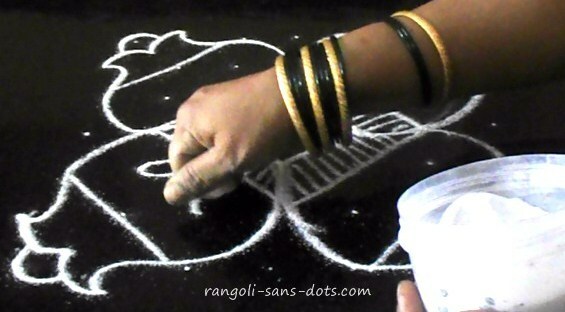 After drawing the patterns (curved lines ) through the centre the remaining dots are used to get the birds heads. That is shown in the next image. The dot remaining before the head is used for drawing the beak. The next kolam in our series with 7 dots ( I am updating the posts as and when I create kolam) is a birds kolam design . The dot template or pattern is 7 to 4 (in between dots). After placing the dot grid draw the three S shaped curved lines intersecting at the central dot. Draw curved patterns to get the head of a bird. Add beaks to all the birds. Add bright colours as they are associated with birds. Draw the crown on the top as shown to get the final design. The same design can be filled with dark blue or green with more colourful decorations on the crown to represent a peacock. However that would be a poor representation of what nature can show off. We cannot get the shine or glitter of peacock feathers but at least we can try. 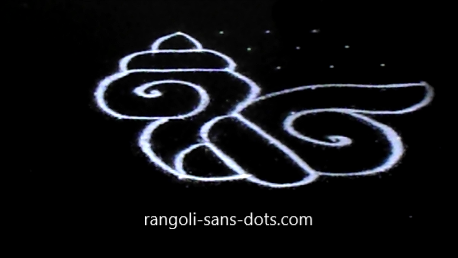 The next birds rangoli is a 7 dot design with dot grid 7 to 4 ( idukku pulli or dots in between ). 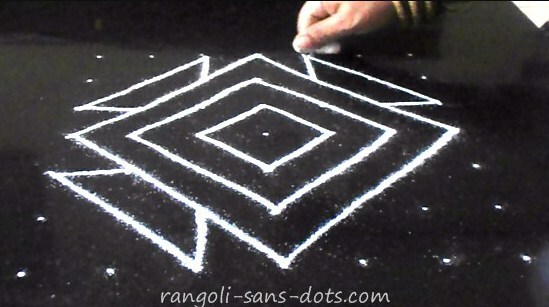 The first black and white image shows the first stage of the rangoli. 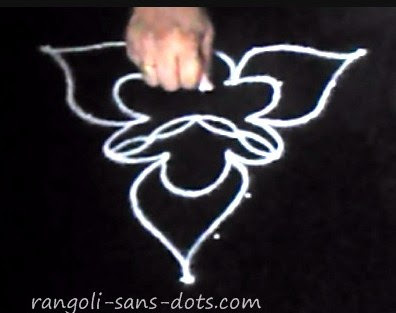 Draw the petals at the centre, join them with curved lines. 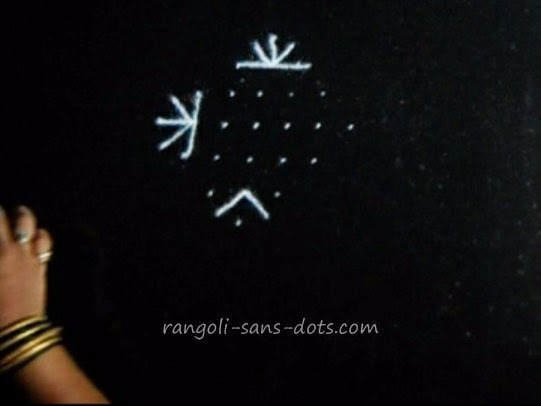 Draw the body of the birds around the dots as shown to use the dots as eyes. Use the remaining dots to draw the wings. That leaves six dots in front of the beak of each bird. I have used them drawing a simple floral pattern. 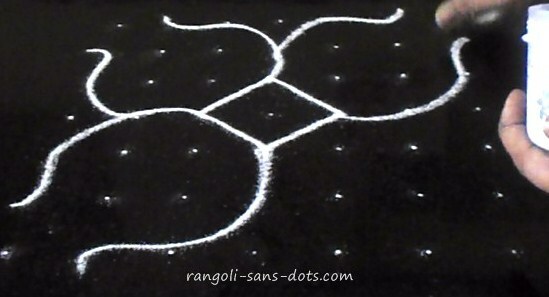 This rangoli is also drawn with 7 by 4 dot grid ( in between dots ). 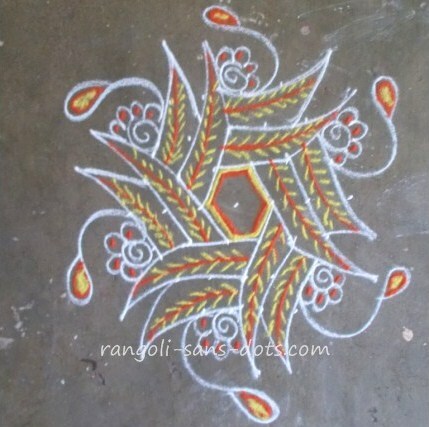 In this case I have used four petals at the centre. In the gaps between any two birds I have drawn bird designs that appear as if they are perched on a branch. 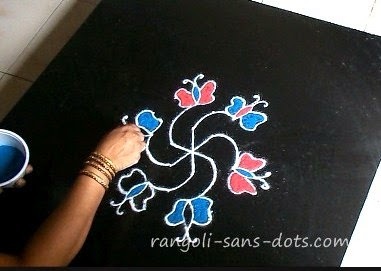 Quite an easy rangoli. 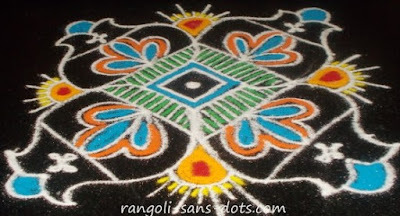 With the same dot grid 7 to 4 ( interlaced dots ) and following the same pattern we can also get a different kolam design. 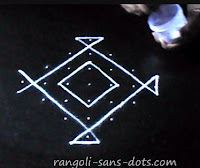 Instead of birds we can complete the kolam with lamp patterns as shown in the images below. The two images above show this rangoli design in two stages. 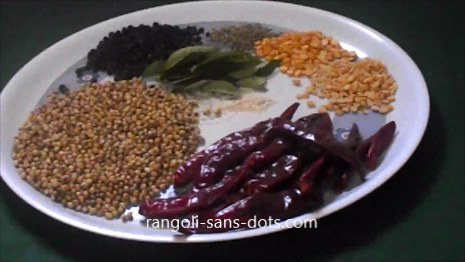 Normally we have maavilai ( or mango leaves ) in one stage, since there are two sets of mango leaves (!) 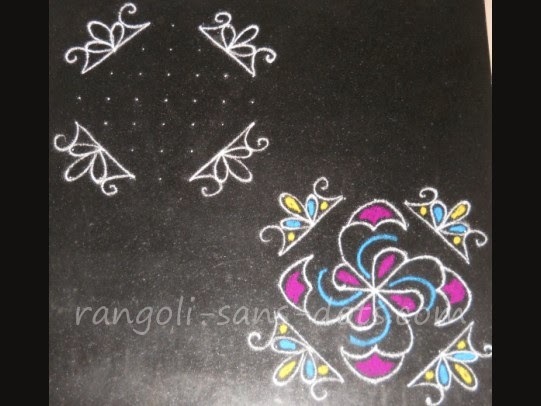 two images showing how to go about this rangoli design are shown. I hope it is clear. Adding colours is our choice. 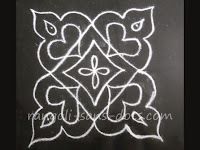 This is the latest design in this post on 7 dots kolam. The template used is 7 to 4 (in between dots) Place the dot pattern as usual. Draw the central intersecting lines connecting the central dot with two dots on either side. Extend the arms on all sides to get six straight arms. Now draw curved lines as shown in two stages. First the coloured patterns in yellow, blue and red are drawn. 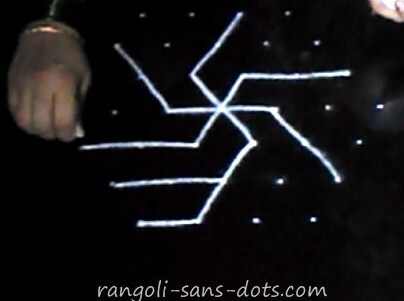 Then the outside white pattern is drawn. This type of design is called maavilai kolam in Tamil as the patterns resemble mango leaves (!). 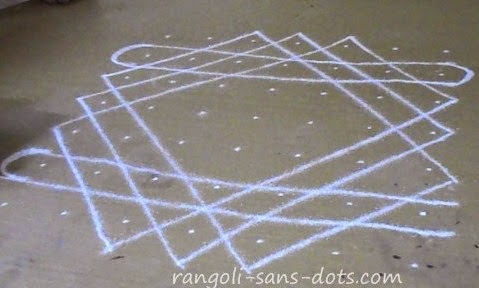 This is a common kolam, 6 dots are left out on the periphery that are circled usually. 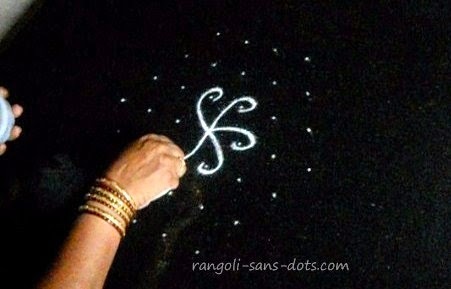 I have added one more maavilai using that dot. That is all the difference. The two images below show the intermediate steps for the rangoli above. 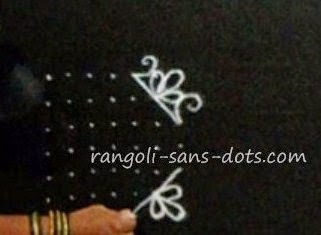 The dot pattern adopted is 7 to 1 (straight dots or ner pulli ). 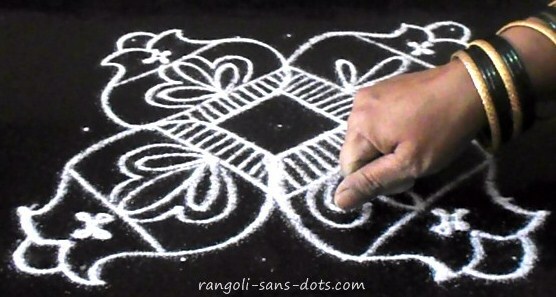 Place the dot pattern with kolam powder. Start drawing the pink petals on on four sides. Use up the remaining dots at the centre to get the pattern in the image above or any other pattern according to your imagination. 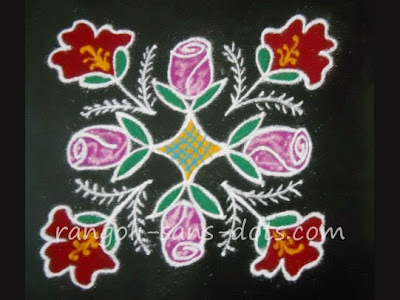 Fill the kolam with flowers to get a simple floral kolam design. 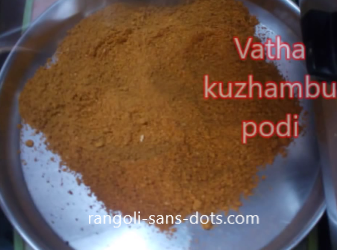 Now, if it is not easy to decide the method, a video can be of help! ( it is in my channel ). After drawing five and 6 dots designs. I suddenly raced to 11 not before posting some 9 dot patterns. 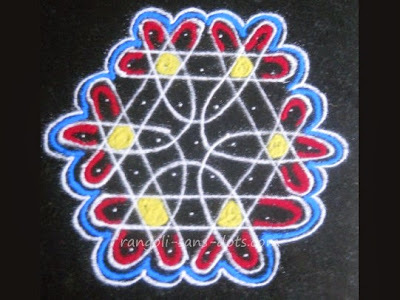 Probably 7 and 9 are the most popular among kolam with dots. Its only a guess. 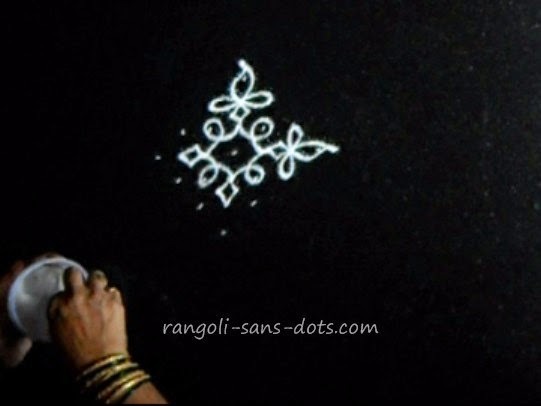 So in this post - the kolam above has a 7 by 7 dot template. 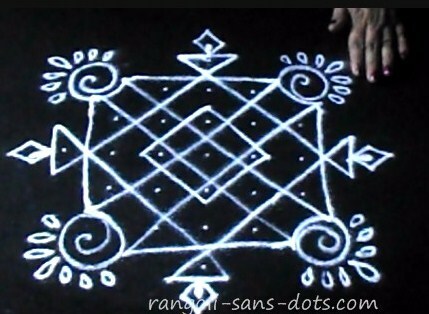 Draw the central design and the four patterns extending from it. Draw the floral patterns on the four sides. Complete the kolam with few colours. I have added a few dots on each flower, to represent the stamens(?) of the flowers. The next kolam with 7 dots - the dot pattern used is 7 to 4 ( idduku pulli or interlaced dots ). 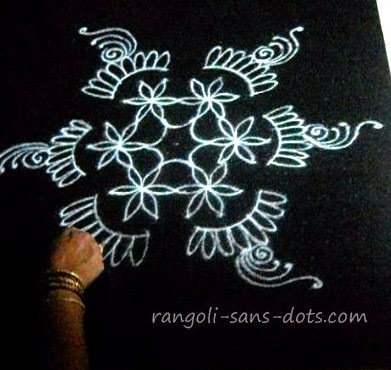 Two images showing how to draw this kolam step by step. 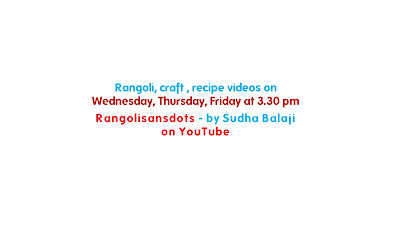 For more steps there is a video in my Channel Rangolisansdots. Another kolam with 7 by 4 idukku or sandhu or idai pulli grid using motifs that are some what similar to the kolam above. The kolam in three steps and the final image, a white kolam. 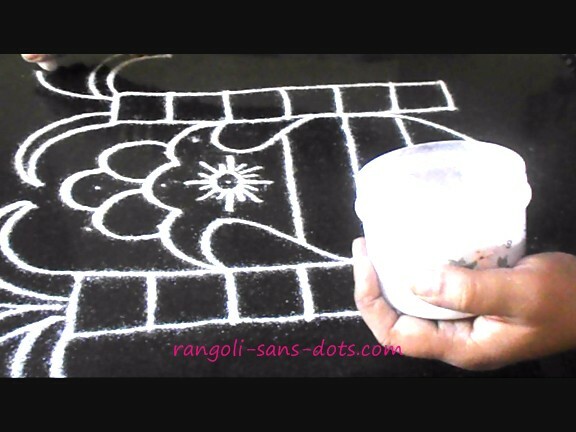 Colours can be added if time permits for this kolam that can be drawn quick and easy.
. One of the important patterns regularly used in kolangal is diya or deepam in Tamil. The image above is with 7 to 1 dot pattern. It is a very easy kolam with dots and can be drawn by beginners also. 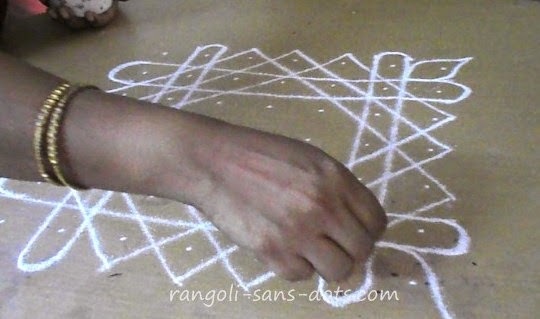 Draw the four lamps one by one. Connect them all with a simple loop around the remaining four dots between the lamps. Add colours to complete the design. 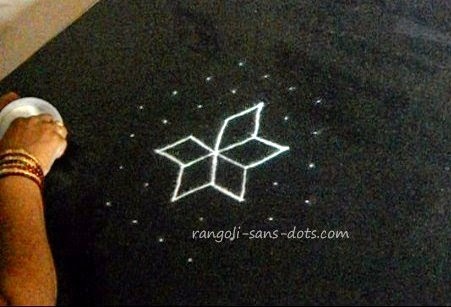 Though it is a 7 dot design I have tried to get a very simple design so that it would be useful for all. 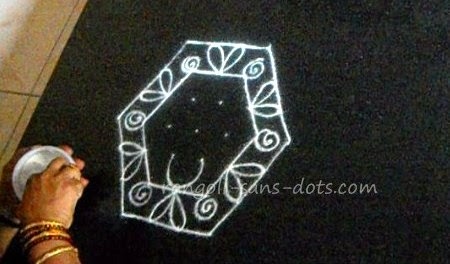 Another kolam with dot grid 7 to 1 dots idukku pulli is in the images below showing the steps to draw this kolam. 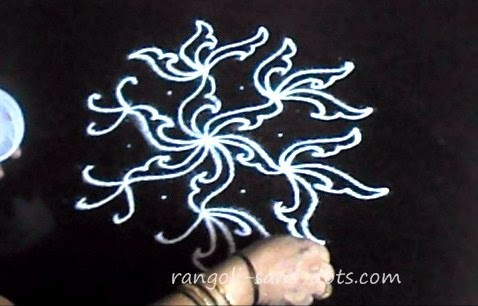 I have added some free hand designs to match the kolam - including lamps or diyas. 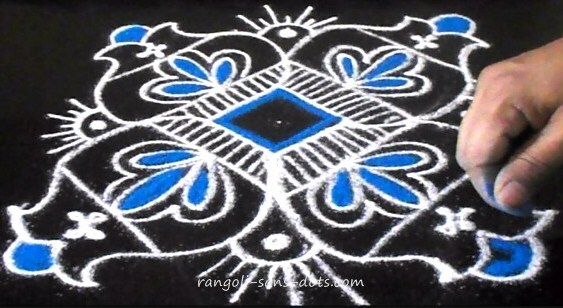 The next kolam below in blue and orange colours. 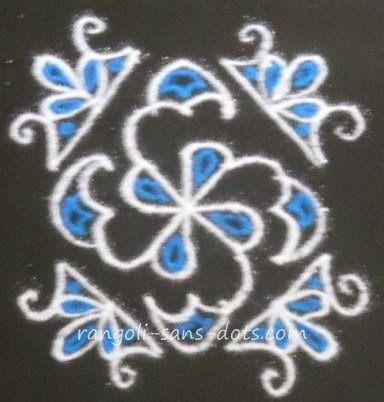 One more simple design using basic patterns or motifs. 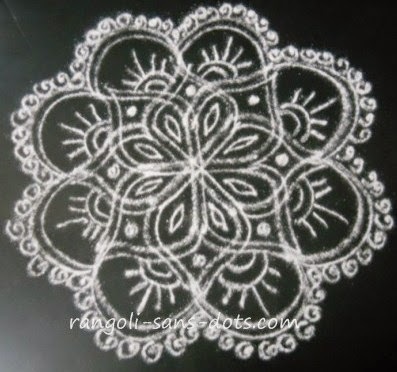 The images below show intermediate stages for this very simple kolam . 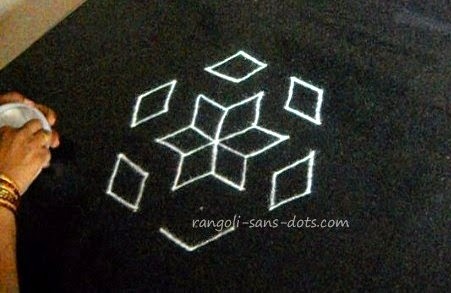 The next design in the image above, is also of 7 to 1 dot template. 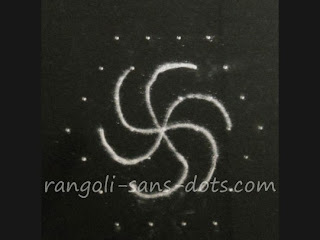 It is also a very easy rangoli with dots and can be drawn in a short time. Draw the pattern at the centre. 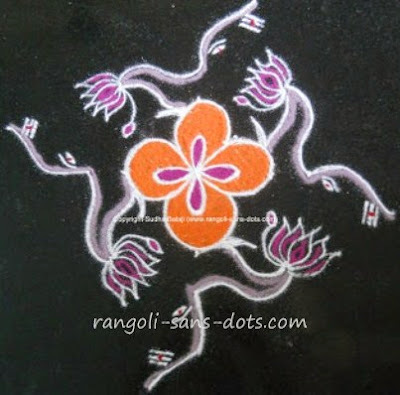 Add the outer motif or pattern in orange colours one by one, connected to the centre with a small rhombus to use up the dots. 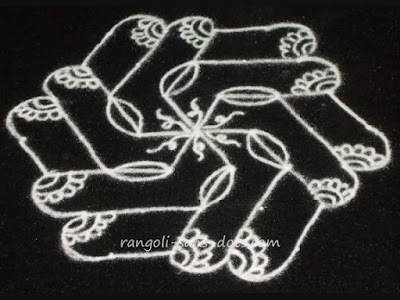 This very simple rangoli design is ready. 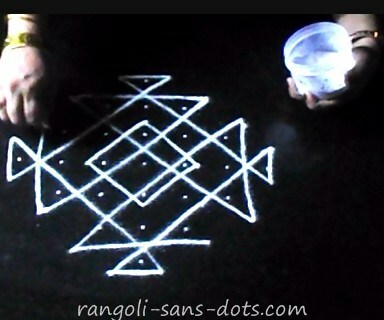 The next kolam - with a 7 by 4 dot grid ( idukku pulli ). 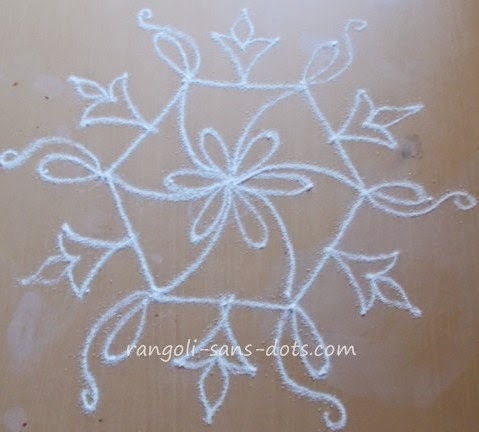 A simple, small yet attractive kolam and hence suitable for drawing at the entrance of our homes. Draw the two outer and inner hexagons. Decorate the space between the hexagons with patterns as shown. 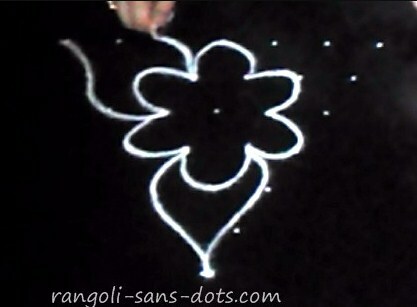 Use the remaining dots to draw floral and petals. Add more decorations according to your imagination. 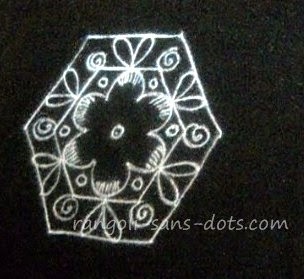 Another kolam with the same dot grid 7 to 4 - the design drawn using some simple patterns. The images below showing two of the intermediate steps. 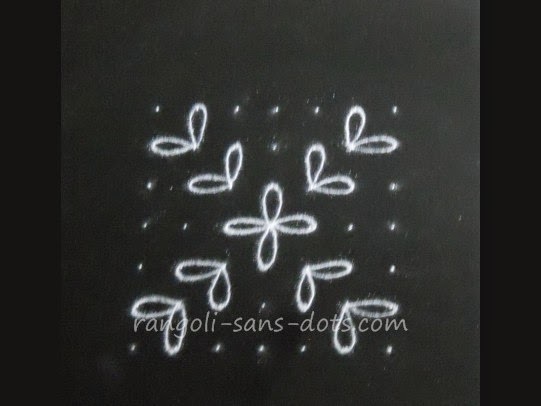 The next kolam in this series of simple kolam after the immensely popular 4 dot and 5 dot kolam in Rangoli sans dots. 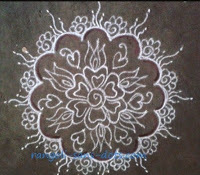 I have shown the kolam in two stages. The dot pattern used is 7 by 7. 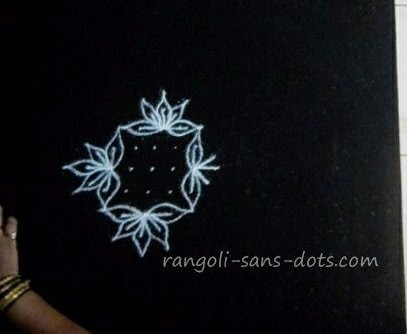 Using this dot grid draw floral or leaf patterns starting from the central dot, radiating towards the edges. 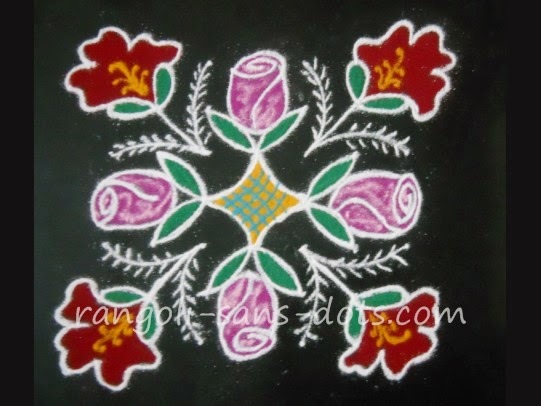 Complete the kolam with petals and patterns resembling rose buds.Add green and pink to represent leaves and floral petals respectively. Learning a new art is important part of Akshaya Tritiya celebrations. 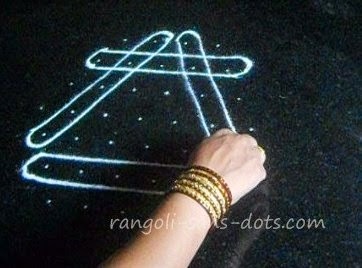 Some of the simple designs here may be useful as Akshaya Tritiya kolam . 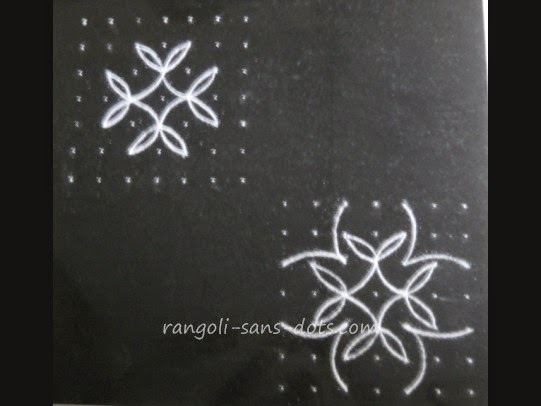 The next simple apartment kolam with dots is a black and white version of a popular kolam from my YouTube channel. The dot pattern is 7 by 7. As always draw the outer designs on the corners of the square matrix. 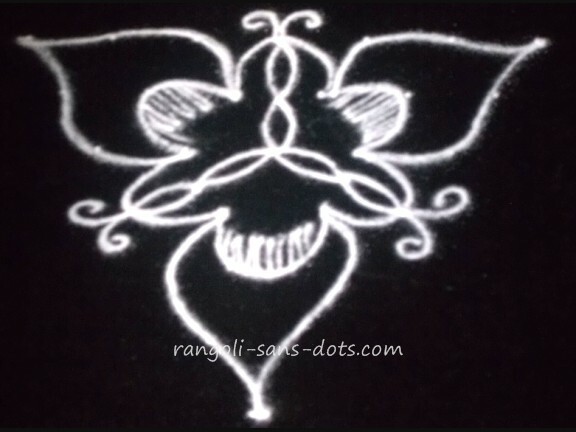 Draw the central floral design and add the four semi circular designs on the sides. 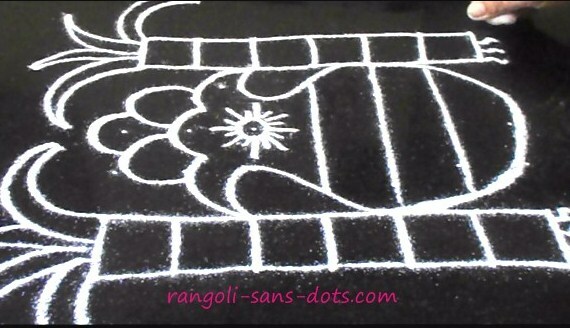 The rangoli design above is 7 dot grid type, the dot pattern being 7 by 7. The four pink petals are drawn followed by the four patterns in red and pink being drawn. The four slightly curved lines filled with yellow and blue delineate the central and outer parts. After filling all the colours the patterns with white rangoli powder are added to complete the design. The thumbnail gives a clear picture ( I think ). 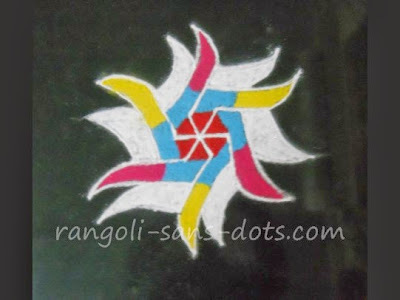 My sister, discussed the rangoli with dots drawn in Maharashtra as a result there may be some influence of Maharashtra rangoli with dots in this kolam design too . 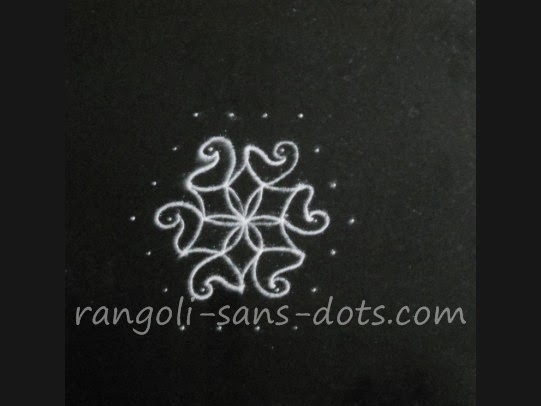 I drew this for a simple rangoli design with dots for Diwali. The white rangoli also has been added to give an idea of how this pulli kolam is drawn. 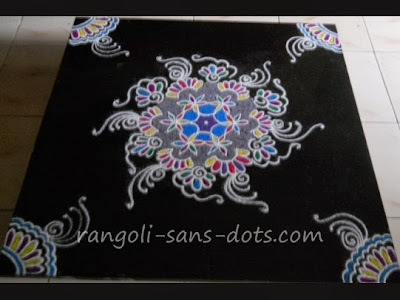 Rangoli designs with only dots can be combined with free hand rangoli patterns also to get a more beautiful rangoli. One example in the pictures below. 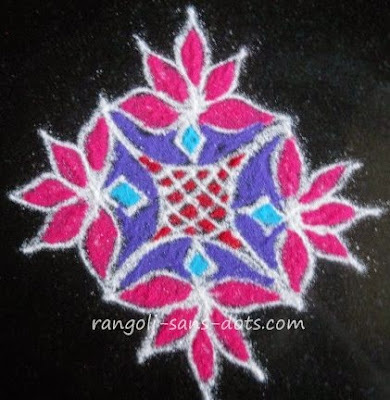 rangoli / kolam with colours for Holi or Deepavali a combination of dotted and free hand rangoli ! 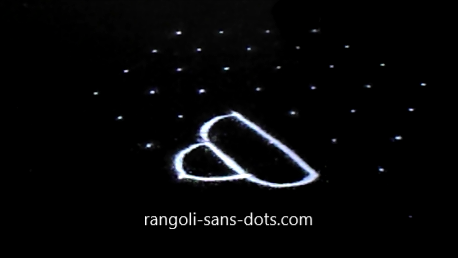 Rangoli-sans-dots is also about colours through rangoli. 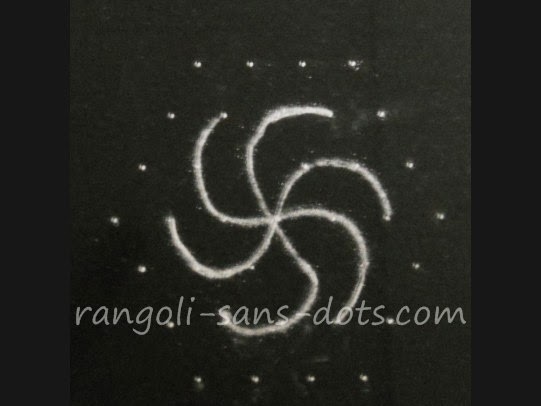 So this rangoli designs for Holi of 2014. 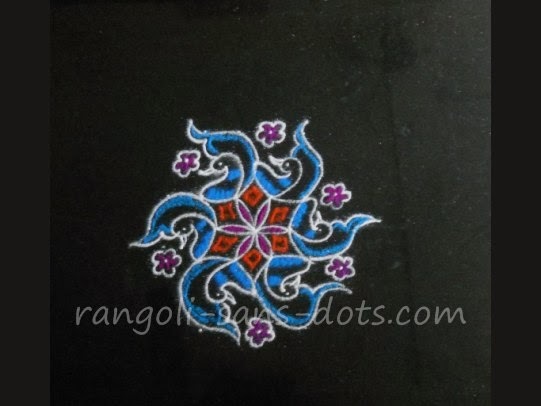 The rangoli for Holi, a free hand design ( however the central floral pattern can be drawn with dots - the dot pattern would be 7 to 4 ). Add floral and other motifs around the flower at the centre. 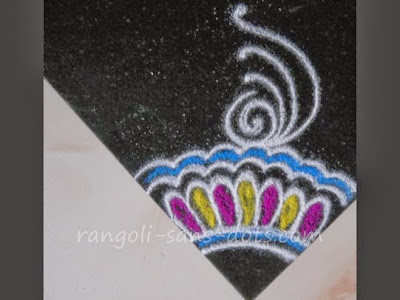 Add border designs congruous with the rangoli on all four corners. 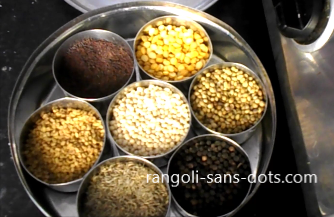 Fill as many colours you would want to ( after all it is for Holi the festival of colours ). The image shows the close up of the corner rangoli or border design that is part of the complete rangoli design. It is quite a simple border. 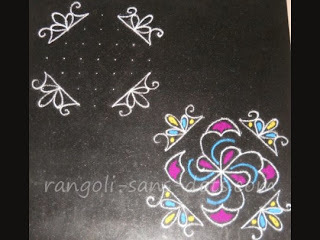 Some examples for ideas of corner rangoli designs are given in the images below with some description. 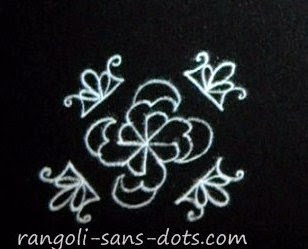 The next design is a part of flower pattern. 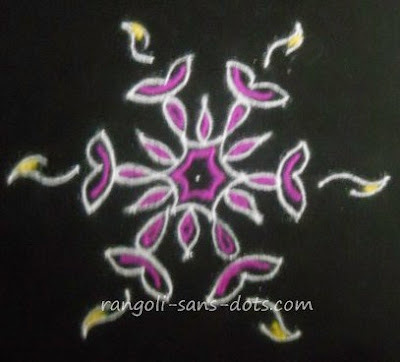 Since only a sector of a circle is required for a corner rangoli design, a few petals decorated with borders result in this design. 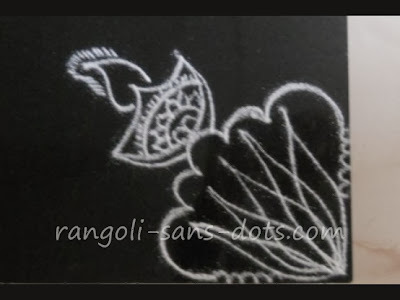 .The next rangoli for a corner is a beautiful floral and diya combination. 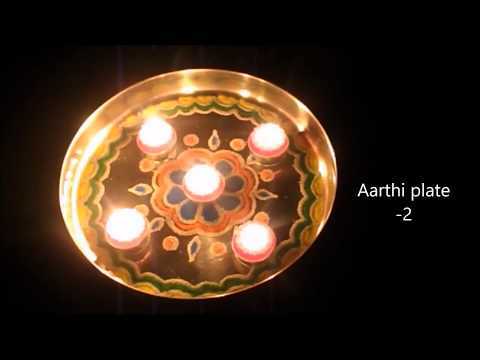 It starts as a part of a lotus covered by a curved line pattern and on the top is a simple diya design. If the design is filled with colours it will be more beautiful. 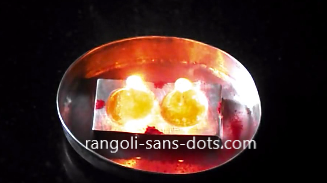 A design suitable for festivals like Diwali and Karthigai when importance to diya designs is more. The next design for a corner is a leaf within a leaf design. 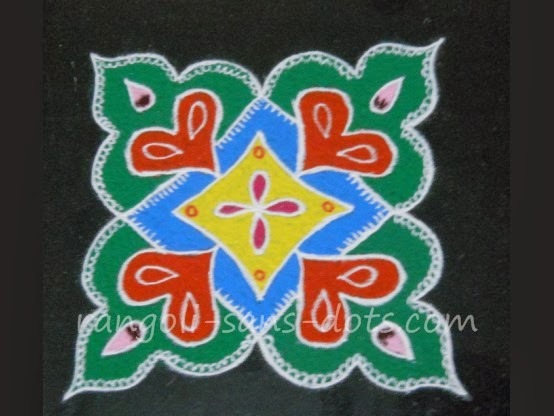 We have a creeper with leaves and two flowers drawn with white rangoli powder and a leaf pattern encircles it. This is like an alpona design only difference being this design has been drawn with rangoli powder while alponas ar drawn with rice flour paste. 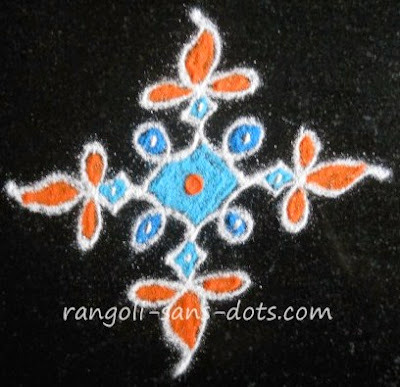 The next kolam is of dot pattern 7 by 7. Draw the floral design on the four corners. Then add the design at the centre. 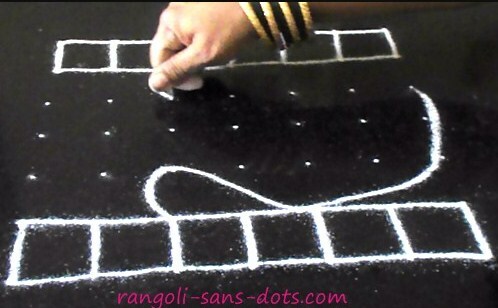 Connect both with some simple designs as shown. 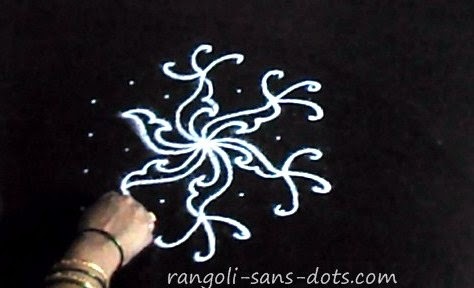 It is also a simple rangoli with minimum colours and can be drawn in a few minutes . Draw the central design in blue and connect the edges to the pink floral petals. and use the remaining dots with patterns of your choice. 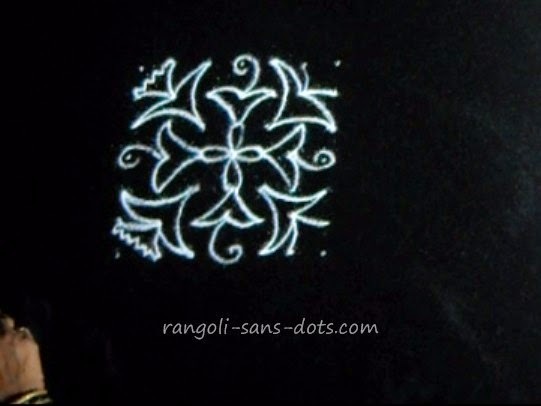 The two images in black and white give us an idea as to how to draw this kolam. There are many art forms like the Rangoli of India. 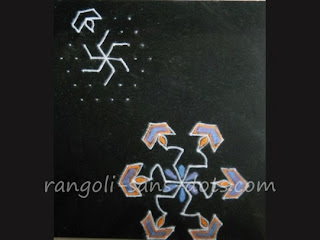 I have been trying to discover through the 'net more visual art forms of India and also of the world. 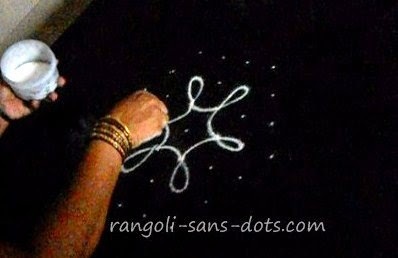 Another important art form in India - women of the Warli tribe have been drawing about nature and used objects found in nature. 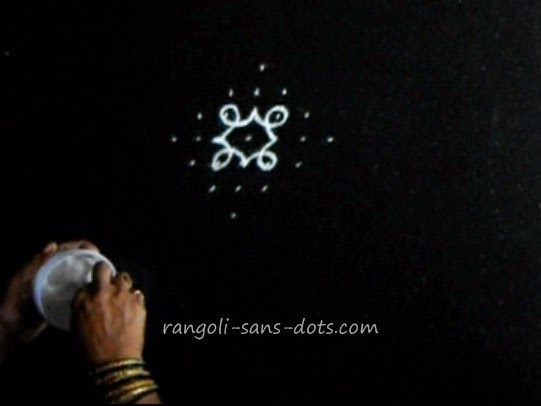 Warli art of Maharashtra in India has been there for centuries. 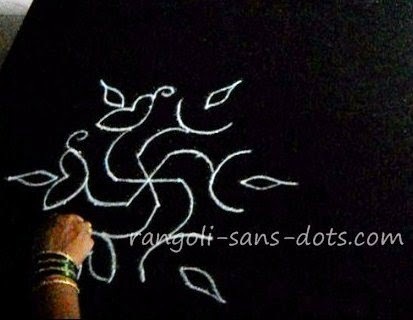 Drawn by women of the Warli tribe, the paintings are filled with lines, circles, triangles and other simple geometric shapes to represent nature. They radiate happiness, joy. Another member, an ancient one in our collage of arts. 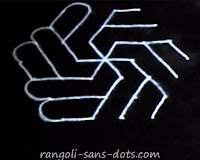 Then there is the celtic wire design that is a beautiful art and is similar to our sikku kolam patterns to some extent. Poovidal is another type of floral arrangement of Kerala, the contribution of Tamil Nadu to the collage of arts and crafts, is immeasurable. One important contribution is the Thanjavur painting (Tanjore painting). These paintings are very beautiful and radiate holiness. I am fortunate to have two such paintings - of Krishna and Lakshmi. 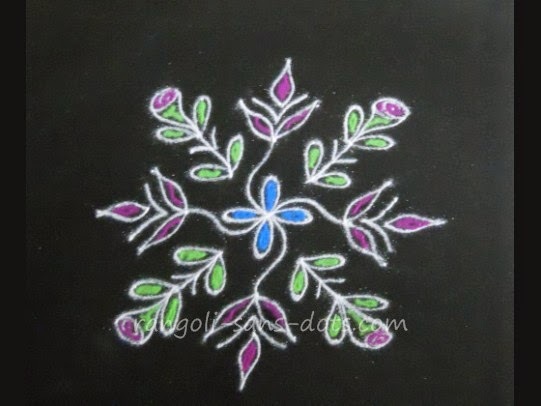 A collection of 30 simple kolam ( 4 to 9 dots ) videos - 30 kolam for 30 days in a month is at 30 kolam designs on my YouTube Channel. The videos view time is 30 minutes. Fortunately schools here also are giving importance to art including zentangling. I was pleasantly surprised when my daughter brought this zentangle home from school. I think she has done a pretty decent job. The design radiates from the centre like a free hand rangoli design with different patterns in each ( shall I call it sector ). I think each pattern drawn is beautiful and different. One thing is for sure, we need a lot of patience to draw this beautiful art form. 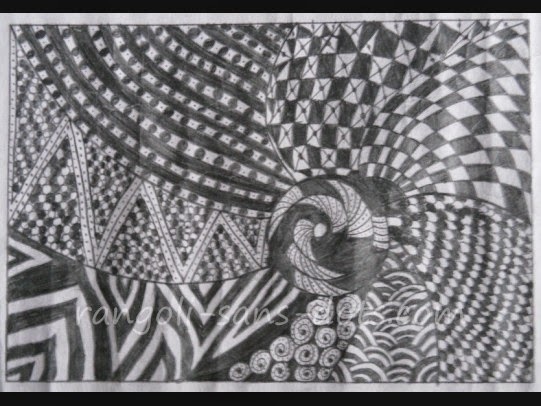 The image above is a zentangle drawn by my daughter for her school project. 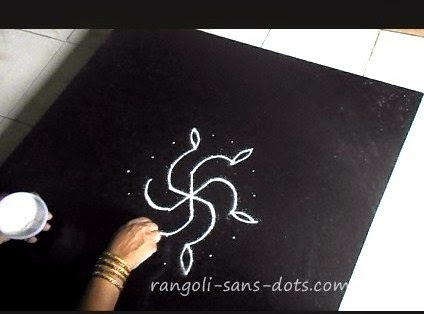 She wanted me to add this and other art ideas done by her in Rangoli-sans-dots.